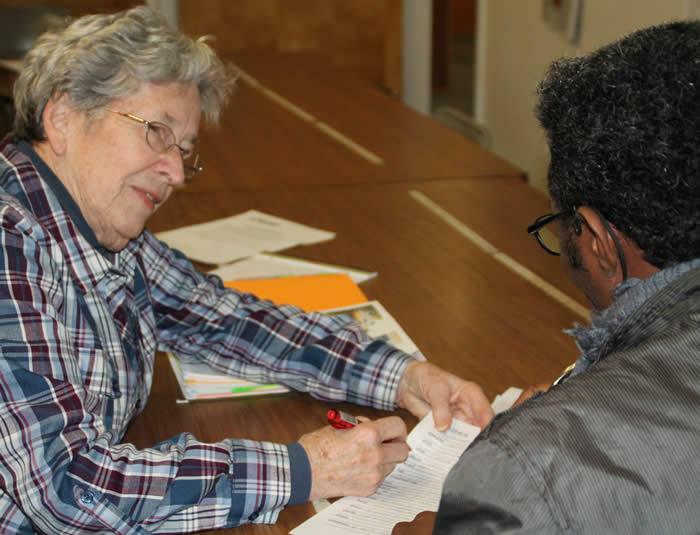 Volunteer Louise Thoman works with a client at IICONN. Most non-profits spend so much time on raising funds, their potential for growth is limited. Giving to good causes is something many of us think about at the end of the year, as we send off a donation to a non-profit that we support. But what if you had the means and business expertise get more deeply involved in the work of your chosen cause? A new organization in Connecticut wants to harness that kind of talent. Don Kendall and Angela Andersen met by chance, about a year ago at a soccer match. "I go to a church in Weston that collects furniture and various goods that are given to a refugee family, so I had the task of delivering the furniture to a refugee family from Eritrea," Kendall said. "Afterwards, [I] went to this big picnic where soccer teams from Ghana and Congo and Afghanistan play one another, at the annual IIConn refugee picnic. That's where I met Angela." Kendall is a highly successful entrepreneur. Andersen runs IICONN, the International Institute of Connecticut, a nearly 100-year-old non-profit that provides services to immigrants. Both saw the meeting as an opportunity. "Immigrants built the United States," Kendall said. "I have a personal interest in helping immigrants create better lives for themselves." Kendall's new organization, Social Venture Partners, is now working with IICONN to test out a hypothesis - that business acumen can change the paradigm for non-profits. The mission of IICONN is to help immigrants towards self-sufficiency. With three offices around Connecticut, it reaches about 7,000 individuals a year. The majority of its funding is the classic non-profit mix of grants and donations, but it does also have a business that generates revenue. "One of the core programs that we run is a legal assistance program, and we have both attorneys and immigration counselors on staff who are very well versed in immigration law," Andersen said. When clients come in for that kind of assistance, they're charged a fee. That business model within the charity attracted the interest of Don Kendall. "At the end of the year," he said, "they break even on that business, but it's not a business that is costing foundations or costing donors any money, and I was excited about the potential to help Angela and the institute grow that business." Don Kendall, the founder of SVP in Connecticut. Kendall grew up in Greenwich, the son of a CEO of the Pepsi Corporation. In his 20s, he branched out on his own, founded a series of businesses, and grew two of them into billion-dollar companies. "When we came back here," he said, "I started looking around for ways to make a difference in my local backyard. Connecticut -- Fairfield County in particular -- has an enormous reservoir of business talent, people who have been successful in their business careers, and I guess I have the belief that people who have been successful at some point want to start giving back." The model Kendall chose was an organization called Social Venture Partners. It began in Seattle in the late '90s, dreamt up by former executives at Microsoft: wealthy individuals who wanted to do more than just write a check. "What SVP provides for people with a business background," Kendall said, "is an opportunity to give their money, [and] also give their time." SVP members work closely with the non-profits they fund, opening up the books to find ways to help them maximize their efficiency. When the newly-founded SVP chapter in Connecticut chose IICONN as its first test case, it placed three partners, including Kendall, on the charity’s board. The problem for most non-profits, Kendall said, is they spend so much time and resources on raising funds, their potential for growth is limited. "Eventually, when you're growing a non-profit, you tap out," he said. "You tap all of your resources, and you can't raise money beyond a certain scale. The number of non-profits that break through is a small number." He pointed to Teach for America as one non-profit with a charitable business model that's been able to grow itself to sustainable scale. Andersen said that working with Kendall and SVP for almost a year has changed her approach to her job. "It made our strategy go from a vision," she said, "to a real plan that I feel completely confident we're going to be able to execute." Kendall started the Connecticut chapter of SVP with 12 partners who, among them, set up an investment fund of $150,000. In the year since its founding, it's now grown to 20 partners, and is actively seeking more.